Forrest Trump Proves SNL Right Once Again - Joe.My.God. 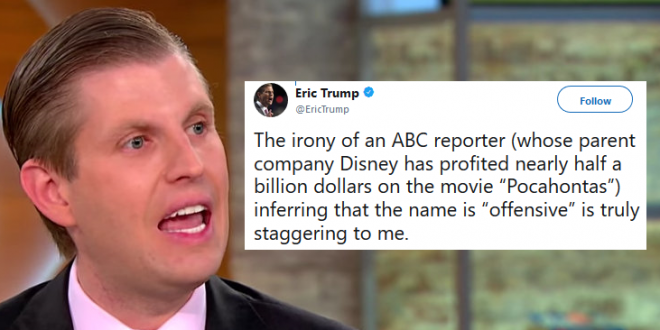 Eric Trump on Tuesday argued that an ABC News reporter didn’t have any right calling the President’s use of “Pocahontas” as an attack offensive. President Donald Trump on Monday called Sen. Elizabeth Warren (D-MA) Pocahontas, an attack he uses often, during a White House event celebrating Navajo code talkers. The irony of an ABC reporter (whose parent company Disney has profited nearly half a billion dollars on the movie “Pocahontas”) inferring that the name is “offensive” is truly staggering to me. Eric, let’s have a chat. First, lets start with irony. I know you used it in your tweet, but tbh, you prob don’t know what it means. Okay, now lets break down the ABC reporter/ Disney thing. If I am talking about you and I say, “oh, its Eric Trump” – not offensive. Ummm, bright eyes, that movie was about celebrating the actual person Pocahontas. Your father using it as a term of derision for a Dem senator in front of heroes is what is offensive. Eric Trump is a buffoon. And the correct term for his incorrect statement is “imply”, not “infer”. Like it is easy to infer that Eric Trump is an idiot when he implies that his father is a normal human being.